In this episode, we discuss some of the fundamental concepts of online marketing. This episode is critical to so you have a grasp of the key concepts and ideas so you know what you can do and how you can do it. Like what you hear and see? Darryl King: Welcome to My Bloody Website, the podcast show where we talk all things online for small and medium business owners or executives who still refer to their bloody website. I'm your co-host Darryl King. Edmund Pelgen: And, I'm Edmund Pelgen. Darryl King: Morning, Ed. Nice to see you here again. Edmund Pelgen: Morning, Darryl. How are you? Darryl King: Great. So, episode four, and so today ... well last couple of episodes we've covered a few basic fundamentals, had a few rants, talked about how business owners or executives should look after things. 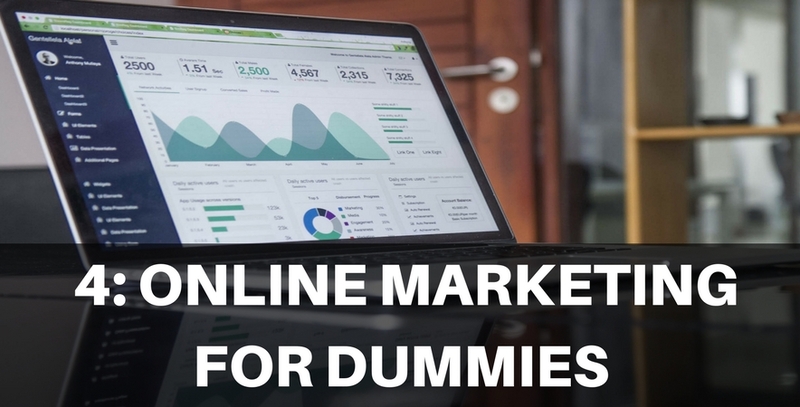 Today, we're going to talk about "Online Marketing 101" for dummies. Edmund Pelgen: Just the basics. Darryl King: Just the basics. But, to help ... in our intro podcast we talked about there's a lot of confusion and misinformation. And, I experience it a lot where I think people refer to elements of their marketing in generic terms, and while ... some people do that consciously, a lot of people don't do it consciously they do it ... it's just all muddled in their head. So, why don't you explain in broad terms, a definition of "what is online marketing?" Edmund Pelgen: Yeah, I mean I think we overcomplicate it. Right? At the end of the day online marketing is simply the process of delivering any sort of marketing message, using the internet. It's really that simple. Right?And, I think the confusion comes for a lot of people, because we confuse the channels. Right? The ways that we deliver the messages at the end of the day. And, I guess it's the problem for us practitioners too. We get caught up thinking "oh, well I'm an SEO guy" or "I'm a pay-per-click guy" or "I'm a social media guy or gal" Right? And, then you tell that to customers and they get confused. At the end of the day, all of it ... all of these channels are simply ways of communicating with your audience, sharing a marketing message. Darryl King: That's causing the confusion, right? But, it's a really good thing. I mean marketing ... a lot of people confuse branding with brand. A lot of people confuse marketing with advertising, and I don't think that's any different with the online space, people confusing the fact that, what they think is the only marketing they're doing online. Darryl King: "Well, I'm running a pay-per-click campaign, I'm doing online marketing." When, in fact, their website is online marketing. Their email newsletters, the footer of their email signature is technically online marketing. Edmund Pelgen: Do you know there's a framework that I used in a speech a couple months back, which I thought was very helpful to most people and when you approach online marketing, as a business owner or as an executive and you think "where do I spend my money?" Right? I think. It's important to think of just two things. One, right? "How much money do I have?" "What's my budget for the investment?" And, the second thing is. "How quickly do I need a result?" And, depending on the mix of those two elements there will dictate what channel, or how, you're going to spend your money. Right? To get the results you want in the timeframe that you have within the budget that you've got. Right? Darryl King: And, you're talking, I guess, strategic decisions. Darryl King: And, what tactics to implement. So ... and I think in future episodes you'll probably espouse a lot more of your deep knowledge about tactical stuff. You know, like ... we want to get a little bit more specific about things that cause confusion. So, why don't you ... why don't you answer some questions then that we know, and I know you get this a lot, but ... because I don't always have the same discussions with people necessarily, but why don't you first off explain what we call "SEO" Search Engine Optimization. Why don't you explain what it is? And, we will get to all those other things and what it isn't later, but what is Search Engine Optimization? Edmund Pelgen: Yeah ... absolutely. So, Search Engine Optimization is simply the process of making sure that your content, your website pages, right, can be found by potential customers when they're online either looking for a product or a service or they're looking for information to help them solve a problem, find a solution for those problems. It's the process of making sure that your website, right, has the ability to get found and does get found when those customers need to find you. Darryl King: So, can I SEO my Facebook page? Edmund Pelgen: No. It's primarily about the website. The asset that you own there. Right? And, so if you ask an SEO person. They'll say there's two elements to it. There's what's called "the onsite elements" the things that you can do to your website to improve how it performs. And, then, the offsite elements, which are the things that aren't on your website specifically but that you can influence. And that's things like PR and getting people talking about you that will ultimately help feedback and result in Google showing your website more often when someone is looking for something. Darryl King: And the non-rich ads. That's all. Edmund Pelgen: So, what we're you going to say? Your question? Darryl King: And, I guess we're not showing screens, and I guess maybe in future shows we could do that. But, you know there's a lot of confusion about everything that's on a Google search result. Darryl King: What do we call that? What's the effect? These are organic results. Right? Edmund Pelgen: Yes, and so here's the problem. Right? The real estate you're looking at ... you pull up your browser and now, especially, more importantly on your mobile phone, there's a limited amount of space. And, the reason why people were chasing high-position with rankings is that behavior will show that people will typically only look at the results on the first page, and if you're higher up on that page you'll get that click-through and you'll get the customer looking at your wares as it were, right? The challenge for any business owner or executive is the fact that Google makes money by selling advertising on that real estate. Right? The bait is, "okay, let's allow you to rank high" and whatnot and rank your websites, but you'll notice that if you look at a Google search results page now ... the ads sit above the traditional, organic search results. And, organic being where your site ranks by merit. Right? So, there's ads there now pushing you down. In addition, you've got issues with what Google is showing. You know, universal search will show things like images, video, right? Maps. Right? Darryl King: Okay, well ... specifically about that then ... because we're talking about ... you know, we want to help people understand the difference. So, I do these onsite and offsite things for my SEO, okay? And I'm ... that's going to help my website or pages rank better. Does that work, does that help me show up in that map? Because, you know what, my competitor has a marker on the map. He's there number one on the map. So, if I do this stuff is it going to make my map show up? Darryl King: See, hang on right there, so if I do my onsite stuff or my offsite stuff does it get me in the map? And, you just said no.Not natively. Edmund Pelgen: Well, you have to make sure that you actually submit yourself to the maps. Darryl King: So, this is another ... it's more like another sub-channel right? Darryl King: So, how does someone, to explain the map, how does someone get in the map. Darryl King: If they're not in the map how do they get in the map. Edmund Pelgen: Yeah, well I think it's important to explain the maps will appear when your search is what's called "local in nature." Right? I'm in Brisbane and I'm looking for a plumber and I do a search like "Brisbane plumber." So, Google knows that if I'm doing that kind of search that I'm doing a local search result. And, it will show a map. So, if you are a local business ... you serve a specific area. You need to be listed in the system called "Google My Business" and that system is designed for local business owners to list their businesses to provide information about it. Provide the address, the contact information, right? So that, it can present your business to someone in your area for something that you provide. Darryl King: Okay. So, questions that come up. I go and list my business in my Google. Is it going to make my other pages rank well? Darryl King: Okay. So, the reason I asked is to say that the individual Google products don't necessarily influence and I'm leading the question a little bit because people ask this. Because we're going to talk about paid ads. And quite often people will say, "well, I run paid ads because they'll help my other listings show up better." Or, vice versa, and you know, I guess that's an important thing to understand. These channels in a lot of ways operate independent of each other don't they? Edmund Pelgen: Absolutely, and they're for various different things right? Local. Like I said, Google My Business is maps. It's all about delivering local results and you see it now we've got personalized search results for everyone online. If I'm on the Sunshine Coast and I do a search on my desktop I'll see a set of results that you won't see for the same phrase. In addition, if I'm on a mobile device and Google is tracking me ... that's why they bought Android, right? And, they build phones. They know where I am and they'll deliver personalized search results for me. It's just the way it is. So, in order for you to be found ... in organic search as it were, you need to understand, first-of-all, and that's what Google is doing. And then, B, you need to make sure your website is optimized for that experience. For, say, mobile location and that you're in their systems if that makes sense. Darryl King: Okay, so then, what would ... sticking a little bit with the Google footprint to start, and these are all different channels ... so we have ad words. We talked about that. They have sponsored ads at the top of the search results, sides, bottoms, depending on where you are and what devices you're using. So, maybe explain what paid ... a little bit about ad words particularly but PPC as well. What is it basic to? Edmund Pelgen: Yeah, absolutely. So, Google ad words is a pay-per-click system where you bid on specific key word phrases that people go to Google and search for, right? And, that's a really key thing to understand because later on we'll probably talk about Facebook. They have an advertising platform as well, but Google's advertising platform is driven around keywords. So, someone has a question in their mind or they're looking for something and they go to Google and they will search using a specific phrase. Well, Google ad words allows you to say "hey, when someone searches for that phrase, I'm willing to pay $1, $2, $3 to show my ad up and if they click on it, I'll pay you that three bucks." So, it becomes an option system. You've got a competitor who's willing to pay more to bid more per click, then their ad will appear above yours. Now, it gets even more complex because Google is not just about he-who-pays-the-most wins. Right? It wants to deliver the best experience for the end user. So, there's all these other things that factor into what they call a "quality score" of your ad, your ad copy, your page, the landing page, all that sort of stuff ... but at a very fundamental level it comes down to a combination of what you're willing to pay for that click and the quality score of your ads and page and everything else. Darryl King: Well, and I think I often explain to people that Google is in the business of making money as they all are. You know, like there's lots of free services [inaudible 00:12:43] So what ... and you've just got to bid more ... it's not all that. So, if someone might have a $20 click price and they're initially number one listing ad the second ad could be $7 click ad, click cost. But, the first gets clicked only once a day. The bottom one's getting ten times an hour. Google's going to promote that one higher because they make more money. Darryl King: You know they get clicked so much they're getting ten, you know, a hundred to one, whatever it might be so, ultimately it's not just about their price it's also about other forms of marketing. Is my copy good? Is my ad readable? Darryl King: But, you're paying to drive traffic [crosstalk 00:13:31] offline advertising that people are more familiar with. You know, I run a radio ad I'm trying to drive a little action. It's immediate. Now, if I booked it for next week they run next week rather than, and maybe you talked about right at the beginning about how you would want to invest money and how long are you prepared to wait for a result. A thousand people are looking for it. I want to get in front of those people. You don't create demand. Right? People ... there are a limited number of people searching for that. So that's the first thing you need to understand. So, with Google ads you can literally be up immediately. However long it takes you to write an ad, to create the copy, to put in your credit card details, to pick a landing page and then click submit and run those ads, you could be up immediately. Right? The big issue, right, that you need to think about is when it comes to running these ads is that not all ads are going to be successful and every time someone clicks on it they are costing you money. Darryl King: when we talk conversion focus we're talking about generating a result. In other words, a sale and talk about that a little bit please. Edmund Pelgen: I probably should have ... meant a transactional focus. Let's say, you know "emergency plumber in Brisbane" right? Someone goes into Google and searches that, you know they're looking for a plumber right? So, you can bid on that phrase. But, here's the key thing, you need to ... Okay, you're in the mindset of the customer, you understand their need. They search for "emergency plumber Brisbane" you have to make sure that you write an ad that speaks to the mindset of that person. "Looking for an emergency plumber? Need help right now?" You know, 24 hours, whatever that is. That's in the ad and then it takes you to a landing page that makes it easy for that person, right? To do business with you. So, you need to think about the message, the key word phrase they're searching for, the mindset of the customer, the ad that you run, and the landing page that you put them on to make it as easy as possible. Right? Darryl King: And, it's also like you said ... and you can be up straight away. So, and I guess what I was leading for was the idea that I can be up straight away. So, if I've got my thinking right and I do it well, great. If I had, today, to start to get found for search optimization organically. Darryl King: That's not an immediate thing. Darryl King: So, it takes time and ... we'll get into that detail in another session where we explain to people why ... when they're told it's not an immediate, instant fix, believe that. So, the thing there is when you talk about the demand from the market there's also a business demand or a business need ... you know, what we need the phone to start ringing. Darryl King: You're not going to implement SEO today expecting a result next week. Edmund Pelgen: No. That's right. Darryl King: So, we're not going to say how long because it's going to vary but I can start paid campaigns right now. Darryl King: And, test their effectiveness very quickly which is the other side to it. Darryl King: Because you can turn them off. If that ad's not working I can pause that ad, and I can keep running some ads that are working. So, if you have an immediate need for business you'll start with the paid channel so you can get the pundits through the door as it were and see what offers are converting. Right? But, at the same time, I always tell people, even when you start with paid ads it's important to step back ... and you know we talk about it all the time, the fundamentals of your website right? The speed at which the page loads, whether the content is compelling, that actually impacts the performance of your paid ads as well. So, I would suggest even before you get to the point of saying "Okay, do I make a decision to spend money on ads or SEO?" Make sure that the website is fast. Make sure the website operates well. Right? Because, it will impact how well your ads perform and, in longer term of course, your SEO. Get the technical infrastructure right. Make sure you've got all your tracking codes and all of that sort of stuff. And, then if you need sales start with paid advertising. Darryl King: So, we've now got, and I knew this would happen on this topic because it's a big topic and a lot of the show is going to reach into these areas right? Darryl King: And, you're already getting there and I know you can't help it, so it's all about tracking codes, we're talking about all of this stuff. My Bloody Website, okay, we won't have time in this session to go down and explain all of this. Darryl King: We'll get ... well we've got to get to, there's a lot of different ad forms for paid. You've got Facebook paid ads. You've got Twitter sponsored ads, you've got Instagram ads you can sponsor, and that's just talking about some of the social media channels. There are other channels out there that are more than acceptable including paid placement on sites for display ads, for blog posts, all sorts of things that can happen. Darryl King: The fundamental differences between Google ad words and Facebook ads because there is a difference in the way that they target and the way they approach things, and maybe I'll throw up a warning to people. A lot of people try ad words and a lot of people try Facebook ads ... don't get great results. Throw the [inaudible 00:19:35] the bathwater, "I'm done. I'd never do it again. They're crap." Partly because they didn't have the strategic approach, like you talked about initially, "like what am I trying to achieve?" Secondly, probably pointed them to the wrong page, so fundamentals are wrong. Darryl King: Took eight seconds to load on the mobile, just couldn't be bothered, or they just couldn't do the transaction because people forget ... so there are all of those things, but there are some fundamental differences about how you target people on the two platforms and they have quite different purposes so ... keep listening and we'll try to introduce to you to concepts in future shows on how you can find people help with ways to do your ad words better or your Facebook. What are the differences? Edmund Pelgen: So, at a very base level, I mean, if you're looking at the primary two big plays in the paid traffic space, you're looking at Facebook ad and you're looking at Google ads. As I've said before, Google ads is all about harvesting demand in the form of keyword searches right? People have a problem or they have a need and they'll go and do a google search. You can bid on the ad. But, on Facebook there's no keyword phrase targeting per se. So, it's kind of interruption marketing, as it were, but what Facebook has that Google doesn't have to the same extent is that they have demographic information. They have usage and behavioral information on billions of users. Right? So, the power of Facebook is that you, if you understand who your customer is, who you want to be in front of. You have the ability to target them. Right? And, put your marketing messages in front of them. No doubt later on we'll talk about what is the appropriate message. You don't jump in front of someone and say "hey, buy this now!" Darryl King: But, it's that whole thing of saying "well, I can target people that are female, 35-50 that have a great interest in triathlons." Darryl King: And, so my special goals and stuff ... you can actually target into an interest demographic combination. Edmund Pelgen: Correct. And, your goal is, that as your ad or piece of content streams through that newsfeed they might see it and then click through to the website. Darryl King: Yeah, you can put action buttons and stuff obviously there. Darryl King: Okay, well they're the two fundamental ones. So, alright. We want to wrap this up because obviously we don't want people sitting here for two hours. Darryl King: We're going to start somewhere. People have looked at this. They might have experience or they're scared of doing it. Before they get in, what's the best way to approach starting online marketing. And, you've touched on it a little bit ... Hey, I need to get the fundamentals in order. But, how do they ... and I suppose we don't want to use the word audit for everything, but actually look at their marketing and say "well, what do I have? What do I not have?" You know. I've got a website. Okay. And, you talk about speed testing, performance testing, all of that in future episodes. Darryl King: I've got one, where's it at? What do I do offline? Because that's really important. They understand their message is consistent everywhere. What did and didn't work offline? Right, have I been running ads in magazines? In industry-specific stuff? Have I got posters? Have I got a radio ... you know, whatever it might be. And then, I think really important, what resources do they have? Because, this is more resource intensive isn't it? There's a big difference between, "I got this magazine to do an ad for me and it runs for 3 months and I don't have to think about it." It's a bit different. So, the resources and capabilities to oversee them, because they will make a decision, "I'm going to get an agency or a consultant to help me do it" versus "we're going to do it internally." Darryl King: So, how do they do conduct an audit of this? And, the first thing, how are they going to get started, right? What are they going to do? Edmund Pelgen: That is a stupendously difficult question for most people. Right? Because, you know, one of the things I always tell people is to try to find good, knowledgeable partners who are willing to educate your about all of this stuff, right? Without the expectation to be paid up front ... not so much that they want to spend a huge amount of time, but to be willing to educate you. As you know, you might spend a little time upfront educating a new client who's not familiar with it. So, are they saying these things? Or, does it sound like it's a hard sell? So, that's the first thing try to talk to a number of people in this space. And, not just people from SEO or pay-per-click advertising. Just talk to a whole bunch of people right? Because, the reality is there are good people and there are bad people out there, and you want people who can help educate you to make a better decision. Right? Darryl King: Maybe jump in there. A lot of people over the years have extended their services to offer things because their business was losing business. You know, a good example in the early years of graphic design agencies that only did graphic design started doing web. Well, technically they can design a website, but they don't necessarily know all the technical side of every part of it. So, unless they build those skills they're not necessarily the right person to do it. And, I think the same thing with your paid and your SEO, that people are possibly taking advice from people that aren't experts. And, George Glassen in the Richest Man in Bablyon talk about "If I'm going to invest in jewels from a far away place get a jeweler to buy they jewels. Don't go and get your plumber to go off." Darryl King: So I think that's the thing are the people ... is their business being run and improved by whatever type of marketing you're going to do? Is there ... do they run paid ads themselves? Or, are they just selling it as a service because they can make a commission. Or, is their SEO good? Do they rank? Or, those sorts of questions. Edmund Pelgen: Yeah. I mean I am hesitant to try to sort of knock anyone on the head. But, you're right there are ... the example that you chose is awesome and we see it a lot. The print agency who's moving into digital and stuff. I think that given the complexity of this space you are going to want to find people who are experts in this specific area. Yourself, you're an expert in web design, hosting, I mean you've ... you know, shameless plug he's written a book about it right? So, try to find people who are experts or consultants right? Have those conversations read their blogs. You'll educate yourself better. But, just be aware that you don't want to get sold something just because it's in someone's kit. And, this is the challenge. You know what I recommend? Keep listening to this podcast. [crosstalk 00:26:08] because it is a continuous space. And, if you keep listening we will tell you how to avoid the harlots and how to find really good people who can help you and what you can do next. Darryl King: And, I think that's the important thing. We're not talking to contact us. This is about information sharing to help you make better decisions where you go. So, to summarize it I'm probably going to say, there's a few things to consider. One, there are no magic bullets. This is not an easy pathway to miracles or dollars flying into pockets. But it's also not that complex that you've got to just run away from it. What you have to do is approach it. We'll cover more details in the future and there's a number of terms you're going to hear that relates to online marketing. We've talked about conversion optimization, that's known by an acronym called CRO. There are things like CPM which is used in ads. Analytics we've talked about. We talked about auction bids or prices in an auction. SERP which is a search engine result page. Darryl King: Back links. All sorts of terms you're going to hear. We're going to help educate you on it, but there is no magic bullet sometimes you'll [inaudible 00:27:15] we want you to understand more about it and understand how to learn to talk to people. So, thanks Ed you had some great, great insights today on the basics. I know we're just touching the service. Darryl King: But, hopefully that provides some great value to listeners out there about just separating the difference between ... so they can talk because I think when you talk to someone else if you get someone that comes to you and says "you know well, my PPC rank is at the bottom of page 2, it should be moving up every time I get a new link." You go, "this guy doesn't know what he's talking about. So if you understand it better as an owner or a marketer you can have smarter conversations and you know, when you sound smarter, you're going to get a better result. Edmund Pelgen: Absolutely. Absolutely. Well, that's awesome. I think that's it for the day. What do you reckon, Darryl? Edmund Pelgen: Excellent. Now if you want to be notified when the next episode goes up please, once again, go to mybloodywebsitepodcast.com or subscribe to us on iTunes. If you enjoyed the podcast, as always, please we'd love it and appreciate it if you left us a review. And, we hope to see you here next week when we continue this chat about "my bloody website." It's goodbye from me. Darryl King: It's goodbye from him.